In a potential neuroscience breakthrough, University of California Berkeley scientists have proposed a system that allows for thousands of ultra-tiny “neural dust” chips to be inserted into the brain to monitor neural signals at high resolution and communicate data highly efficiently via ultrasound. a lifetime. Current BMI systems are also limited to several hundred implantable recording sites, they generate tissue responses around the implanted electrodes that degrade recording performance over time, and are limited to months to a few years. Neural dust could also provide the large-scale recording of neurons required for the Brain Research through Advancing Innovative Neurotechnologies (BRAIN) initiative, the scientists suggest. Thousands of low-power CMOS chips — neural dust — are embedded (via fine-wire arrays that are then removed) into the cortex between neurons. They detect extracellular electrophysiological signals via an electrode and a piezoelectric sensor converts ithe signals into ultrasonic signals. A subdural (the dura surrounds the brain and keeps in the cerebrospinal fluid) ultrasonic transceiver (transmitter+receiver) receives ultrasonic signals from the neural dust.It also powers the neural dust with ultrasonic energy. A battery-powered external transceiver communicates via ultrasound with the subdural transceiver and transmits the data to an external computer. Embedded ~2 mm. in the brain, the powered neural dust chips can be as small as tens of microns (millionths of a meter). Ultrasound is attractive for in-tissue communication given its short wavelength and low attenuation. The design also uses more efficient “backscattering”: instead of transmitting energy, the chips passively modulate ultrasonic energy from the sub-dural transceiver and reflect it back. 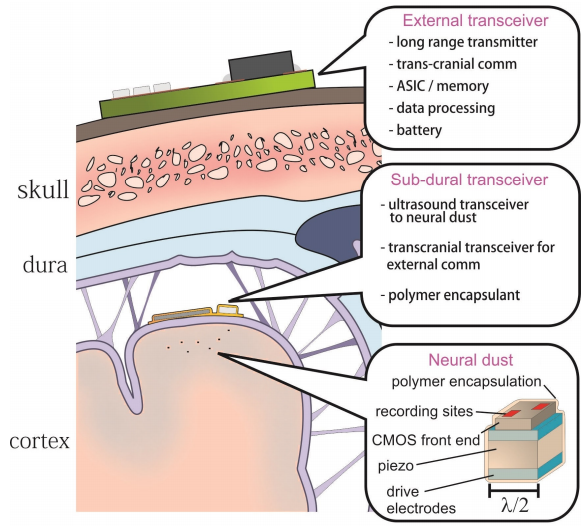 The researchers calculate that the neural dust chips can be as much as 10 million times more efficient that chips using electromagnetics (magnetic or electric signals), which have high attenuation in brain tissue. They would be encapsulated in an inert polymer or insulator ﬁlm. The arXiv paper mentions a number of challenges that need to be addressed in developing a practical system.